Royal Wedding Wrap-up: Mawwage and Fairy Tales. I left the Frazier Museum party just as William and Kate arrived at Buckingham Palace, thinking that I'd rush home and write up a story about the morning's events for you lovely readers. Of course, once I got home, with the TV on, patiently awaiting their balcony kiss, I decided being alone was lame -- David had to go to work because apparently the price for American freedom means we don't get to observe the Queen's holidays -- and that I needed to run by the home of some Welsh friends, whom I was sure were still partying. 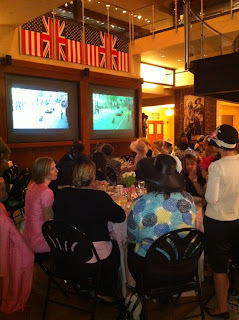 Then I spent the next two hours re-living the ceremony, watching the kiss, and discussing the horrid Fergie girls. Oops. I'm sorry, but I still just cannot imagine what it must be like to be Kate Middleton. Even though she was a well-to-do commoner, surely her parents still never thought she would one day be the Queen of England. This morning's procession was like watching the end of a Disney movie, and even the most cynical among us surely cracked a little bit. Maybe not a smile, but perhaps a glimmer of hope? The Frazier Museum hosted about 110 folks this morning in a sold-out event featuring a catered English Breakfast, mimosas, and a gorgeous wedding cake. They also had some delicious English Breakfast tea, which I forgot was super-caffeinated (so now watch out as I run around the neighborhood a few times). On the two giant TV screens, they projected the BBC coverage of the event, which was focused more on the tradition and ceremony than on what the Beckhams were wearing (though I must admit I could look at that footage of D-Beck all day long). 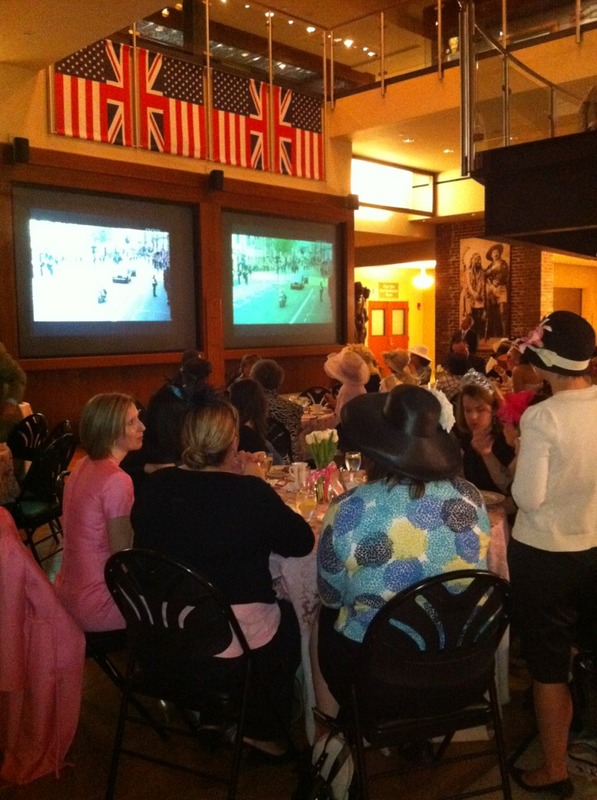 The Frazier even had real live Brits! The Guest of Honor was Ann Green CBE, the Chairman of the Royal Armouries, who spoke just before the ceremony. - Prince Harry stole the show with his carefree swagger and his smirks. Did any of you lip readers catch whatever it was that he said to William while standing at the altar? - Prince Charles looks about a thousand. - The trees in the abbey were gorgeous. And so much better than cut flowers because they can be planted and remembered for hundreds of years. - I LOVED the shots of Elton John singing the hymnals, and I feel sorry for whoever was seated next to him. - Does the Queen just have the same outfit in every color imaginable? What does her hat closet/room/wing look like? - The Duke of Edinburgh looks like the old king in The Princess Bride. - This was like a real Princess Bride movie! - Remind me someday to tell you a funny story about the Royals bathroom habits. - Can we talk one more time about that atrocious medusa fascinator on Eugenie? Or was it Beatrice? I was worried for the Queen's life, with that weapon-like hat inches from her throat. Anyway, today was a nice reminder that fairy tales aren't just in the movies and books. I used to think they were, and that's a sad sad mindset for a young woman to have. Settling for "good enough" or "pleasant" isn't enough of a happy ending for me. Maybe I'm a princess at heart, but I think my demand for passion and loyalty isn't too much to ask. I also think that you get what you ask for. I've been fortunate many times over, but luck is more than what happens TO you. It's what you make happen. And not to get all sentimental, but I think I'm getting just as much as a fairy tale as Princess Kate is. Awwwwwww, let's all cry together now. Royal Wedding, TV, Oppression, and Parties. FWT and I are REALLY excited about the Royal Wedding. Well, that's not entirely true. FWT is kind and willing to sit through the TV documentaries on the Royal Wedding and pretend like he's as excited as I am. I suspect that's for two reasons 1) he loves me dearly and 2) I really never want to watch TV. So this is my rewards for sitting through "Rules of Engagement" and other bad TV shows just because I want to be next to him. Although, I think he is just as excited about the Royal Wedding itself, just not so interested in the Lifetime Movie about Will & Kate. He did have a few comments while watching Royal Wedding TV programming. First is, "Princess Diana was kinda 80's hot." So true. Second, "Kate Middleton is kinda 80's hot too, you know?" I'm not so sure about that one. I could totally see Diana fronting The Bangles, but Kate? Not so much. Personally, I found the florist the best character. They said he'll have over 100,000 flowers on Friday. I also liked the poor folks whose job it is to measure the distance from the plates to the forks and the goblets to the end of the table. Military precision over a table setting ... I would get fired on the first day of that gig. Anyway, what are you all doing for the Royal Wedding? My friends in the UK don't seem to be as excited as I am about the event, but maybe that's because Queens and Kings don't seem so foreign to them. Is it about democracy and oppression? Or is it about exhorbitant and unnecessary expense? I must admit, I wasn't the least bit interested in Chelsea Clinton's wedding. FWT and I are hitting up the Frazier Museum's festivities, but before we arrive there, I think we'll be stopping by various Royal Wedding Parties around Louisville. Apparently, there are a lot of them. Maybe we'll hit up yours? I'm definitely going to wear a tiara, but mostly because it matches my pajamas. See you at 4am! I've already downloaded the Official Royal Wedding Programme. I suggest following @ClarenceHouse on Twitter for the best updates. Cheerio! Ouch, I haven't blogged in a whole week. That needs to change because I'm about ready to head out on the road, and isn't everyone's favorite part of my blog all the crazy travelogues? I promise to be better. I think we'll even shoot video-blogs this time, like I did during my first tour abroad. We'll be visiting some pretty remote and beautiful places, so watch out, Rick Steves. In the mean time, here's a blog I wrote about the Royal Wedding. I know you're excited. Sudafed & Derby = Spring. Su-su-sudafed! That a little Phil Collins-esque ditty I've been singing for the past few weeks, while most of Louisville is complaining that it's summer already. My sinuses disagree. It's definitely spring, and for me that means finally admitting that I'm not all put-together organized like I promised I'd be at the beginning of the year. My taxes are finished, however, and I even paid my first quarter estimates (as opposed to hopping a plane to Paris instead). So I'm pretty much a full-fledged grown-up. There are all kinds of exciting music-related events going on in the coming weeks. I'm actually PLAYING A SHOW IN LOUISVILLE. I know you all seem to think that I still play every Sunday at Air Devil's Inn (that's been more than a few years now), but that's not true. I've only played one real show so far this year, and that was in January. But yay for Derby. You'll get a chance to catch my full band at the Waterfront for the Fest-a-Ville on Monday, May 2, from 6:00-8:00. Then you can see me do a sensitive (ha!) solo show at Jim Porter's opening for Suzy Bogguss on Wednesday, May 4. If you're not interested in my music, but you just want to look at me and wave, you can catch me on Saturday, April 30, playing piano in Peter Searcy's band at Zazoo's. After Derby madness resides, I'm thinking of doing an intimate show as a Kickoff to my UK tour. Anyone have a venue in mind? Last time I played an all-request house concert the evening before my flight to Europe. I'd love to do something like that again, or maybe a show in a nice theatre-like setting. Who's got an idea? I'm thinking Monday, May 16? Maybe Tuesday the 17? I drove all the way to Indiana for Chuy's. That's love. Most of the time my job is not glamorous. Yesterday, for example, I printed posters, argued with the post office about stamp prices and whether I was mailing "printed material" or "parcel" to the UK, and felt guilty because I hadn't blogged in ages. But then sometimes I'll get to travel around Europe for a month, or be a celebrity guest at some big gala, or ... best of all ... go to soft openings of new restaurants. Yes, I know. I like food. A lot. I like Tex-Mex more than most foods, and I will travel far and wide -- even to Indiana -- for the Creamy Jalapeño Dip that comes from Chuy's. They don't just bring it to you with the regular chips-n-salsa; you have to ask for it. And when you ask your server if you could "please have some creamy jalapeño" (manners, folks! ), she will smile and know that you're "in the club," so to speak. My faithful readers know that I flipped out when the first Chuy's opened in Louisville last October (by Oxmoor, the old Bahama Breeze building). I suspect that Louisville having a Chuy's is part of the reason I didn't bother going to SXSW this year -- no need to drive a thousand miles for a Texas Martini (trust me, order one). Despite the fact that the vegetarian menu is limited at Chuy's, I never ever tire of it. In the past two weeks, I've eaten there three times. (I know, I should really just give in and go to the grocery store already.) I've ordered a regular bean & cheese burrito (but please add vegetables), the guacamole tacos, and the vegetarian combo (a chile relleno and veggie enchilada). Truthfully, I shouldn't bother to order anything because I'm always so stuffed with chips-n-salsa-n-creamy-jalapeño by the time my meal arrives that I pretty much just get a ToGo box on the spot. 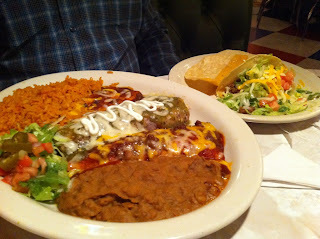 But then that means I have days of Tex Mex sitting in my refrigerator because of the Texas-sized portions, so win win. On Monday night for the soft-opening of the brand new Clarksville Chuy's (1440 Veteran's Parkway, please don't ask me directions, I'm lost outside of the Highlands), FWT and I went for dinner with two other friends. We got all shared the appetizer platter (minus the chicken in the deluxe quesadillas), which could have been a meal in itself. Kris was the meat-eating brave one who ordered the Elvis Presley Memorial Combo, which, as far as I could tell featured one of everything (picture above). I have one request, and this goes out to the Chuy's folks back in Austin who, I imagine, must control the menu: please make a vegetarian queso. I love that your refried beans are not made with lard, but why put meat in something so alread-perfect as queso? But clearly, that's not keeping me away from your fine establishment, so I guess it's not that big of a deal. Anyway, I'm thankful that the Chuy's in Clarksville didn't open before the Louisville one. Otherwise I would have had to break down and buy a new car. Weather-talk is "trite" in the same way that garlic-breath is "bad." Whoever said garlic breath is a bad thing has clearly never enjoyed Italian food, and whoever said talking about the weather is lame, clearly hasn't spent any time in Louisville. Maybe in LA it would be a dull topic of conversation, but here, where we've had all four seasons in the past week alone, of course we're talking about it. We've seen snow flurries, severe flooding, hail, 90-degrees (my personal favorite), the first blooms of the magnolias, and a tornado-ish day that blew all the leaves off my neighbor's magnolia straight into my garden. I don't mind my garden being freckled with leaves, but I feel sad that the tree lost its blooms already. So let's talk about weather. Are any of y'all like me and keep many other cities programmed into your smartphone's weather app? When I'm feeling cold, all I have to do is browse the weather in Yakutsk (currently 10* a heat wave!). Right now both Edinburgh and Paris are a mild 43, while Austin wins the best-weather-award at a perfect 85. Lubbock somehow started hitting 90 degrees back in February, making me extremely annoyed that Christmas isn't in February. I played some music yesterday, and I even wrote a new song. It's amazing what a half-day-off mid-week does for your creativity levels. Then, of course, I woke up this morning with wedding on the mind. 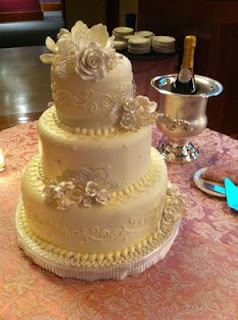 If you're missing my rants and raves, know that I'm keeping the wedding stuff separate. You can read them at www.BluegrassandBluebonnets.com (our personal site) or www.LouisvilleKY.com/category/weddings (where we are blogging our wedding for an audience of many thousand people we don't know -- yikes). In December, I did a quick northeast tour, mostly because some kind folks in Philadelphia invited me to a wonderful House Concert series. (Friends, take note, I will travel far and wide to play a house concert.) While in Philly, I was able to catch up with someone I hadn't seen since our college graduation, more than ten years ago. I've been meaning to write about it since that weekend because it was one of those things that was just really important to me. It sounds silly and sentimental, but that's not my intention. She and I honestly weren't even that close in college; we really just had one good mutual friend. I always liked her though, and I wondered why we never hung out on our own. I remember her being hilarious, smart, and never without a book in her hand -- and always a good book at that. Somehow within the past couple of years, social media reconnected us, and I became what I refer to as a "creepy superfan" of all that she's been doing -- namely writing. She cooks too, and many recipes from her cookbook and her blog are now staples for me and FWT. At some point I figured out that she was reading my blog as well, which led to us meeting up for a quick meal during my afternoon in Philadelphia. Hmmmmmm ... I hadn't intended to write all that in today's blog. Really, I'm not feeling particularly creative today, so I thought I'd just write: Hey, I have writer's block, but my friend Joy wrote this really great blog yesterday. You should read that instead. Then I went and got all sentimental and started explaining myself. Sorry. Just go read Joy's blog, okay? I just thought it spoke really well to anyone who is out there struggling to do what they want to do because, well, any other career would be impossible. Here is the link: http://oysterevangelist.com/?p=713 Sorry for the creepy superfan thing, Joy. (And thanks for not judging us for our "Quest for the Best Veggie-Philly Cheesesteak.") But really, thanks for the blog. And I hope your house sells quickly, so you will stop being plagued by traffic. Eating and playing in the dirt. It's garden time, my friends, and I couldn't be happier. I admit I got a little antsy this year and started some seedlings prematurely -- in containers, thinking I'd move them inside. Believe me, I know better than to plant even cold-hardy lettuces before Thunder Over Louisville and certainly not to plant vegetables before Derby. (We Louisvillians refer to everything around Derby Festival events.) But that week of 70-degree weather and that lying little groundhog had me using The Secret to bring spring immediately. Then one morning I woke up to snow in my container garden and only a few tears. This weekend I removed all the tiny weeds poking their evil heads up in my real garden, and in doing so, I found nine volunteer cilantro babies and two volunteer dills. I love dill because even though it's only an inch high, my fingers smell like pickles for hours after touching it. The cilantro can't come soon enough because that Kroger and even the Whole Foods cilantro doesn't smell like anything. FWT got ambitious and dug out a massive tree stump that has been the center of my garden since the evil dead crab-apple tree succumbed to my musical saw several years ago. But how do you fill a hole left by a tree? 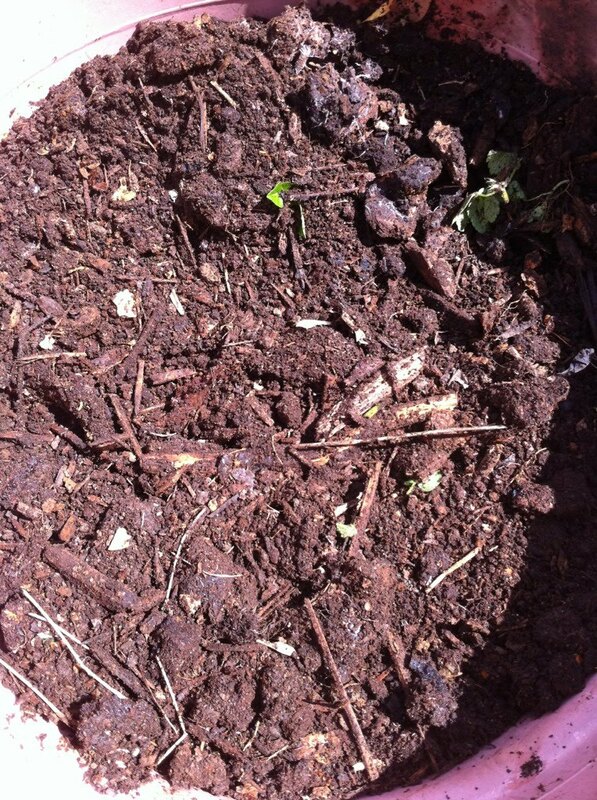 With compost that has been sitting in my backyard as long as the crab-apple has been dead. 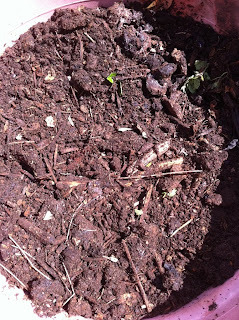 I've been a compost freak ever since I saw that Al Gore movie, even though I'd wanted to try it long before. No matter what you think about climate change (let's please not get into that debate here), it's simply about not being overly wasteful. I'm not exaggerating when I say that I've been putting just about all of my food waste in the compost bin for at least four years. It's no bigger than a trash can, and yet with ALL of that food waste -- and believe me, I eat a lot -- it's not even half full. What is inside, is a top layer of banana peels, apple cores, and peanut shells, but mostly gorgeous, thick, organic compost. It's the first time I've actually used any of the compost I've been cooking, and my soil has now been raked into nutritious perfection. That picture up top is all that remains of many a fine meal cooked in our house. If you're able to compost, you should give it a try. You don't need a fancy bin. You can even get a big rubbermaid container and drill a bunch of holes in it, as long as you can place the bin where it gets sunshine. Aside from the lush nutrients for my garden, what amazes me the most is how little trash we actually make. What isn't compostable is usually recyclable. Additionally, our trash can never smells because there's never any food waste in it. Win-win-win. Sorry for the rant. It's just that it combines two of my favorite things: eating and playing in the dirt.